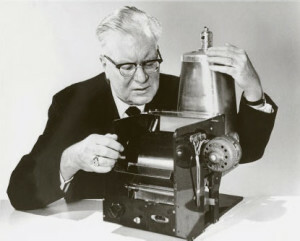 Carlson’s ingenuity, which launched what is today a multi-billion dollar industry didn’t fare well at first: “for several years after patenting his process, Carlson could find no company interested in xerography. It was the invention that nobody wanted,” said aps.org. “[Carlson] developed much of his patience and perseverance during an especially difficult childhood. Born in Seattle, WA, in 1906, Carlson was the only child of an itinerant barber and grew up in southern California. By age 14 he was working after school and weekends for a local printer to support the family, since his father was crippled from arthritis. His mother succumbed to tuberculosis when he was 17. Always fascinated by graphic arts and chemistry, Carlson didn’t let his humble roots deter him from finishing high school and working his way through a nearby junior college, earning a degree in chemistry. He then attended Caltech, graduating two years later with a degree in physics, “ it said. Chester Carlson was left with just two options. Apparently and luckily [for all of the] backsides across America, the big pond and beyond, he chose the correct one: the first xerographic copy was made on October 22, 1938.